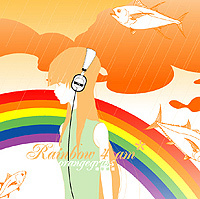 Although I've known that Orange Grass is a local Taiwanese band, I still can't help mistaking them for a Japanese group--especially with album names like "Rainbow 4 AM", which are reminiscent of Brit Rock-influenced Japanese band Quruli. However, after listening to this collection of five singles, I've found my assumption to be false. The lead vocal sings with a genuine voice that depicts youthful life, of the kind which I used to lead, with delicate, poetic lyrics. Whether using the electric guitar, bass or drums, Orange Grass presents a blunt-yet-relaxing style of rock without all the head-banging. This, however, doesn't mean Orange Grass is tame. In my opinion, the songs on Rainbow 4 AM are truly lovely. If you're someone who enjoys viewing things in depth, you definitely will love this album.